Latest News about the Ottawa Market! I have neglected you dear Blog! The big news is the INVENTORY! Or lack thereof! The supply and demand is creating multiple offers and price increases at least for the short term! What does that mean to you Mr. Seller? Its a great time to call us about listing! We have many buyers we are currently working with, and may be able to get you top dollar with low effort and no inconvenience! For our Buyers, what it means to you, is you need to be working with a strong and proactive realtor team who has strategies and doesn't wait for the listings! WE definitely have that covered if you are a serious, motivated 2018 buyer! Call us and set up a time to talk about what we do differently for OUR buyers. Michael and I want to extend a very heartfelt and warm Holiday greeting to you and your families and friends. Whether its Merry Christmas, Happy Hanukkah, or simply Happy Holidays, it is a time to reflect, be grateful, love and share the feelings of the season with each other. It has been a busy, fun, rewarding year filled with helping our clients fulfil their real estate dreams & financial goals. It has been a year of more ups than downs in the market, lots of work & play, lots of laughter & successes (lots of great stories of success this year) and failures (which turned out just fine) and through it all, we always knew that our family, friends, business partners & with each other, we had support, loyalty & friendship at our backs. We are immensely grateful for you, your referrals, your trust, your business & your relationship. We know there are always choices, and we strive to always be your choice, and do not take you for granted. We are actually very honoured daily to be a part of your life. Thank you from both of us. May your holidays be bright and filled with love, laughter & the feelings of the season. The average home is expected to increase in value by 3.5% in 2018. First time home buyers and the Move Up buyer are expected to drive the demand in Ottawa for 2018. The Ottawa real estate market is expected to be balanced. I wouldn't hold my breath on the market being balanced. If inventory levels continue to be light, and demand high, I suspect we will see a similar type of market in the spring of 2018 - a lean towards a sellers market. January 1st, 2018 is bringing further changes to the mortgage rules. The current stress test for those getting insured mortgages (less than 20% down payment), is being rolled out to the other segment of home buyers - those with more than 20% down payment. This WILL impact the amount of mortgage these buyers will be approved for and hence affect their affordability levels. Being aware is the first step, the second step is speaking with an experienced mortgage specialist. We have wonderful relationships with some excellent financial experts - call us for a recommendation and become aware of what 2018 will mean for you! 15 hopeful entries are needing your vote! Go to our FB page and vote for your favourite! 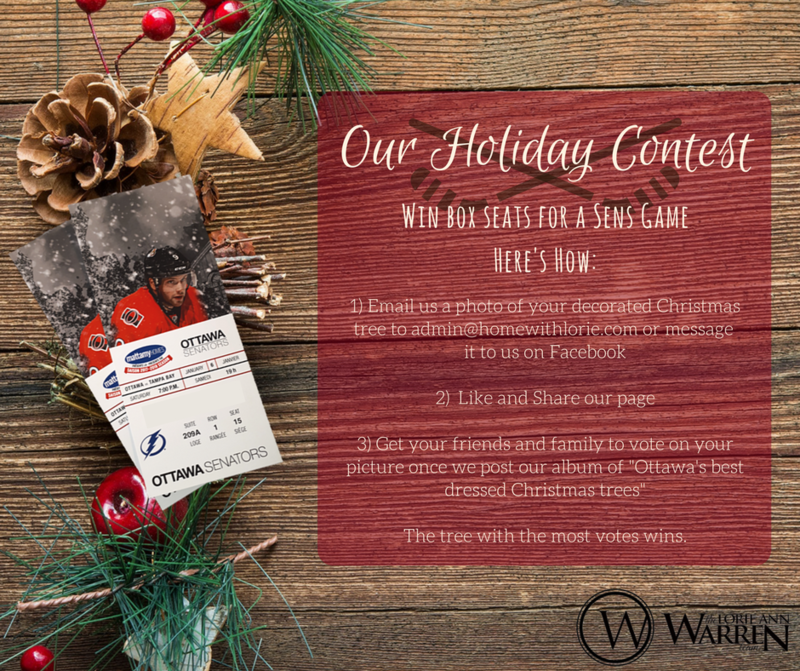 Who knows, maybe the winner will take YOU to the Ottawa Sens game in the luxurious box seats! We LOVE happy clients...it's what makes us roll! We are delighted and impressed with the level of service provided by Lorie Ann Warren of ReMax Hallmark in managing the sale of our two residential properties (a triplex and a four-plex) in Ottawa. With the marketing resources of ReMax, and the selling skills of Lorie Ann, we were able to list, market, and close the sale on both properties within two weeks of the date of listing. And also, most impressively, we were able to sell one property at 100% of the listing price, and sell the second property at a negotiated price above the listing price. In short, we were wowed by their selling skills and personal touch service. We would highly recommend the services of Lorie Ann to anyone who is considering selling or purchasing a property. September rocked! 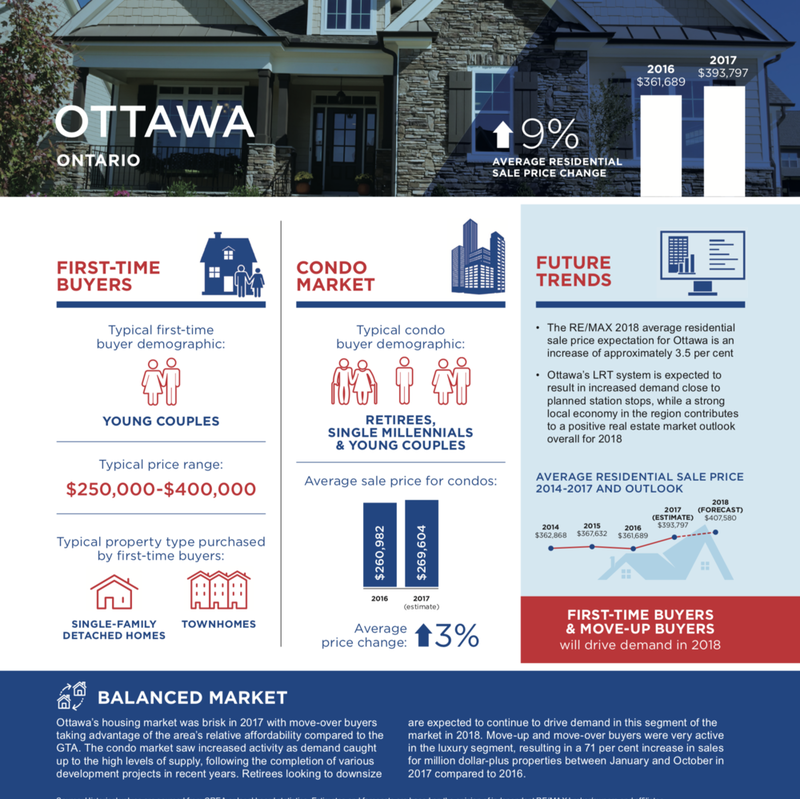 Ottawa is having a stellar year and the fall market is expected to be steady until year end. A couple of key points if you are in the market to buy, or EVEN thinking of selling...inventory levels in some neighbourhoods are actually quite low - so you may be in a sellers market in certain areas. 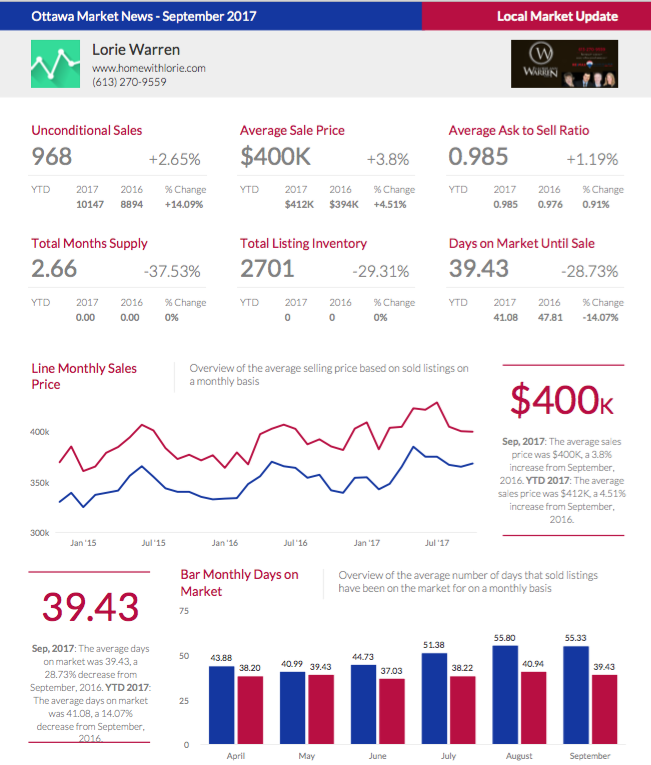 Overall, the total inventory in residential listings are down 10% to last year and in condos 20%. There are many micro markets in both type of inventory and also by neighborhoods. So if you would like to discuss your specifics, its best to give us a call. But overall, 2017 is a very strong year! Happy Thanksgiving to you and your families! I did the 5 day Joe Cross plan and said if it went well I would do an extra day...by day 5 PM if I had to put any more juice in me, I was going to gag. I think it was a whole day of the pre-made juice bar juices (I prefer my own homemade ones)! Here is what I learned about myself and the experience. 1. It is all about the preparation and the mindset. I was prepared up front but not prepared for the reentry. 3. I love food which is fine. I am a foodie. But I am also an emotional eater and love comfort food. 4. When I had two babies completely natural with no drugs, I had a steely mindset that allowed no pain and no needles. I need that kind of mindset for juicing and losing weight success. I would do it again for 5 days maximum. What I need to be more prepared for is re entry to eating. Yesterday I ate a hot dog, a Haagen Dazs and a toasted tomato sandwich and I gained back. I felt the bad food going in like it was poison after all the healthy vegetables(especially the hot dog nitrates). It was not enjoyable. In that small insight lies the secret, if you are usually doing good things, it's harder to eat the bad stuff. You feel like a hypocrite, a cheater. But I can tell I lost inches and I do feel healthier. And I learned it is way harder to take it off than it is to put it on! Our whole team has committed to a 7-day Juice Fast! We are on Day 1. So far we haven't killed anyone. On the contrary, we had several good laughs in the office today. It really is wonderful to have our whole team pulling together in business AND in health. As Gerald said, when we are younger we can afford to have a lot of 'do overs' with diet, weight, and health. But as we get older, we don't get near as many! There is a saying "The first 50 years are a gift. The second 50 years, you have to earn.". Today's Tip: Buy apples (and other produce for that matter) at the Parkdale Market. What a deal! In the picture below, we got a whole bushel (that is a lot of apples!) straight from the Grower for $30, versus $10 in apples from a fancy local grocery store. Thank you for the messages of support that we have already received! It means a lot to us that you are cheering us on! Click on the pictures below to enjoy the pics of our Day 1.
Who would have thought we would be writing a #PefectPatioOttawa blog in the middle of September? The weather this week was Full On SUMMER! We could not resist one more patio lunch, and we were very fortunate to have Diane Tuplin from the Pike Group of Halifax AND Jason Cleland of Ottawa Mortgage Pulse join us for a very delightful lunch indeed. Canal Ritz is located at 375 Queen Elizabeth Drive, overlooking the Rideau Canal. We started with a charcuterie board that was to die for! The pizza was delicious as where the pasta dishes. The dessert, while looking amazing, tasted a bit 'day old', but very forgivable as it looked so awesome! But the view. We all came for the sun, the view and the company!. And that my friends is what life is all about. Enjoying the moments! And enjoy we did. It has been AMAZING doing the #PerfectPatioOttawa and thank you so much for all the feedback. That so many of you followed our antics and destinations, well, that means the world to us! And if you would like 'in' on a secret.... This coming Monday our entire team is doing a Reboot Juice Fast! More on that to follow, but the next blogs will be on where to buy amazing juice in Ottawa! Click on the photo below to scroll through our Patio fun! With summer winding up, we would have been amiss in our search for a Perfect Patio Experience if we had not hit up Tavern on the Hill. This unique 100% patio establishment is perched overlooking Parliment Hill. The Sun Gods were smiling on us as we had the PERFECT day for our visit! Sunshine, cocktails and good company. What more could you want? Hot dogs! Of course! If you live in Ottawa, you have no doubt heard of this place. And I really do have to recommend you go, if not this summer/fall, then absolutely next year when they open for the season. Deviating from our usual ranking of Service, Food, and Ambience, this place deserves a summary more than a ranking. They only serve hotdogs. Gourmet Hot Dogs. They include the Mexican, The Korean (Pulled Pork and Kimchi), and The Montrealer to name a few. All we tried were top notch! Our company had margartias, sangria and sea breeze, and all thought they were spot on. Large, cool and refreshing. We did find ice cream there for dessert as well! And the view! This place is an Instagrammers heaven. All set to the soothing sounds of soft Jazz. You just have to go, chill and enjoy this amazing City we live in! Click through the pictures for more images! The search for the #perfectpatioottawa, had us adding a bit of retail therapy at Nordstrom’s. It really was a perfect location, escaping the rain and/or humidity! We chose to forgo the patio, although others used it that day. If I could give this 6/5 I would. Franco our server was more like the a long lost friend than a server! He works 4 days a week, so when you go, ask if he is there and sit in his section! You will love him! The food was spectacular, fabulous, stupendous! A ‘from scratch', everything fresh kitchen extended to the amazing mixed berry lemonade! Franco made the lemonade from scratch, the bar muddled the berries. Amazing. Don't even ask about the crab mac and cheese! Swoon. And the chocolate cake. LIFE CHANGING. BEST EVER. GO HAVE IT. Relaxed classy elegance are words that come to mind. Foodies, run here! Shoppers, stop here to fortify yourselves! And if you find yourself a bit parched whilst shopping, ask a salesperson for water. They actually bring you iced water! Seriously if you appreciate next level service and quality, Nordstrom’s and Bazille are the perfect 5/5. Check out hashtag #perfectpatioottawa to see where we eat next! Our clients are so special! I know I keep saying it but it's true! Happy Friday of the long weekend everyone! Hope you go and enjoy the beautiful weather and do something fun with family and friends! We live in a great city with so much beauty around us. Get out there and be a tourist in your own city! I am heading home with a smile because I got this great photo from Danielle and Allen. The sign company showed up to put the SOLD sign up and Scoobie was excited too! I have to share, its a perfect photo (for many reasons).